coconutBattery lets you see how much of a charge your battery currently has, how much it can still hold and how this compares to when it was manufactured. It’ll also show you how many times you battery has been charged. SlimBatteryMonitor is a replacement for the Apple battery indicator in the menu bar with something more compact. CoreDuoTemp shows the temperature of your CPU along with it’s current operating frequency. Available in both Widget and Desktop application formats. Not content with just reporting information Fan Control hands over the base RPM speed and the upper and lower temperature thresholds so you can tweak it to your working conditions. smcFanControl is alternative fan control program that provides user-defined cooling speeds and an in-menu temperature readout. MiniBatteryStatus shows you battery status in a compact form on your Dashboard. 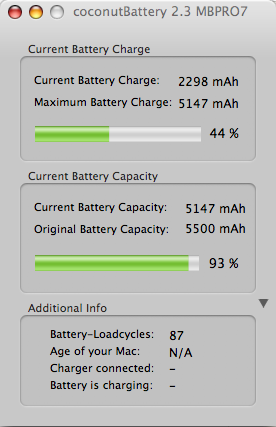 The iStat nano widget has added a battery section to it’s list of information. Temperature Monitor provides comprehensive temperature monitoring including drives and support for non-portable systems, graphs and remote monitoring. It’s been an odd couple of weeks for my MacBook Pro 15″. First of all I find that my battery is one affected by a recall and so Apple send me a new battery complete with incorrect instructions on how to return. Then I find that the whine that my machine emanated from under the left of the keyboard when on battery power gets semi-acknowledged in a knowledge base article. Get call from engineer that machine is ready and collect it! Total time MacBook Pro out of my hands … 3 hours. The annoying whine is gone and the case has yet to get too hot to touch! They also supply new 10.4.6 CD’s (v1.3) with a note that if I need to reinstall Mac OS X I will need to use these as the original ones supplied with my machine will not contain necessary support for this logic board revision. It now reports its serial number as SystemSerialNumb. Hope that doesn’t cause a problem with any shareware applications. Windows XP required quite some time to boot the first time after the replacement board and the fans whirred right up whilst doing so. The iSight camera driver reported “unprogrammed” in device manager. A quick uninstall and detect sorted that out. As most people know these things run quite warm but at last two applications are available for getting hold of those elusive CPU temperature figures. When in Mac OS X grab a copy of the free CoreDuoTemp. In Windows the excellent (but not free) Everest 3.0 will reveal each core’s temperature individually as well as more detail about your machine than you ever cared to know.